Trello is a collaboration tool for teams which organizes pending tasks and keeps a big-picture overview on a project’s remaining tasks. The service is innovative due to its special use of configurable lists (that can be named at the discretion of the user). Each list contains cards describing the tasks required to be performed; these cards can be dragged from one list to another, have people added or assigned, and the changes made to them are automatically synchronized everywhere if there are other opened browsers displaying them. According to the Compete.com data, the site gets at least 10’000 unique visitors per month. Trello was launched in September 2011 by Joel Spolsky. Joel is a rather popular figure whose beginnings can be traced back in 2000 when he founded Fogcreek together with Michael Pryor. Since then he has launched a range of successful services, including FogBugz and StackOverflow. In September 2011 the Wired magazine named Trello as one of “The 7 Coolest Startups You Haven’t Heard of Yet”. List.ly is an online tool for building collaborative lists. 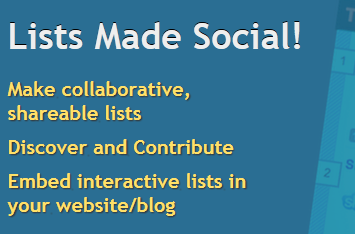 Upon sharing the lists, other users can contribute to them or see what others have added. Each entry in the list can be voted upon, in order to produce democratically a ranking order. Lists can be easily embedded in external websites. The List.ly homepage features trending lists that get the most attention. A search bar for retrieving lists by keywords is also provided. List.ly was launched in April 2011 and currently it attracts consistently over one thousand unique visitors each month, according to Compete. The service was formerly known as twtpickin and it was founded by Shyam Subramanyan. In his Google Profile he is currently listed as founder for BoomyLabs.com .